Yesterday, we posted an article titled “Calvary Chapel Breached” by journalist Jim Fletcher. The article focused on a Calvary Chapel church (North Coast) in California and its invitation of a Palestinian man named Sami Awad. Fletcher’s article showed the implications of this invitation by Calvary Chapel and how this indicates the further move toward apostasy in the church today. One of the signs of a church becoming emergent is the changing views regarding Israel’s role in Bible prophecy. We have documented for years the growing hostility toward Israel by emergent figures. Our follow up today is going to focus on another person who will be at the Discipleship and Training event at North Coast Calvary Chape on May 10th – Lynne Hybels (wife of Willow Creek, Bill Hybels) – and the implications of her being there. First of all, back in 2006, Chuck Smith, the founder of the Calvary Chapel movement, made a clear and concise statement that Calvary Chapel would not tolerate churches within their “fellowship” that promoted the emerging church or contemplative spirituality. While Chuck Smith’s own son was ousted for his emergent views, other Calvary Chapel pastors have been allowed to remain in the movement even when they were promoting emerging/contemplative views or people. What North Coast Calvary Chapel is doing is a case in point. Jim Wallis, founder of Sojourners magazine, is one of the top “change agents” today, and the timing of his surge in popularity should not be ignored, considering 1) the ideology of our current administration, 2) the advance of liberal theology via the emerging church and church growth movements, and 3) the current state of apostasy the church finds itself in today. Are all these connected? Through this man, they are indeed. Unbiblical trends in the church tend to snowball, producing even worse trends: each heretical book or teaching that comes along seems to lead to a worse one; the Bible says in 2 Timothy 3:13 that in the last days, “evil men and seducers [imposters] shall wax worse and worse deceiving and being deceived,” suggesting a progressive pattern of deception. In 1972, he moved his work to Washington DC and renamed it Sojourners. He wasn’t just against the Vietnam war, he rejoiced in America’s defeat there showing his leftist sympathies by publicly criticizing the Vietnamese and Hmong refugees who fled that communist regime (we called them “boat people” back then), by claiming they were leaving to support their consumer habit in other lands … that being greedy capitalists made it just too hard to live under a dictatorship. [ii] In remembering the terrible suffering that the boat people endured, what uncompassionate sentiments by Wallis. In addition, Wallis supported the FMLN, a communist terror group from El Salvador itching to spread their Marxist revolution throughout South America. [iii] Men have been called “traitors” for much less than what Wallis has stood for. Wallis has known Obama for over twenty years, and during the “Reverend Wright” damage control days, he was right there advising Obama on how to spin it, helping him draft many “faith based initiatives,” to make the far left appear to have some form of religion, to sell the church the idea that here is a spiritual alternative to the now defunct Religious Right, which Wallis eulogizes endlessly in his book. In light of all this, one must ask the question, why is this man speaking at a Christian festival aimed primarily at our youth, and with a highly popular figure from the evangelical camp, namely Luis Palau? What is this social justice that is supposed to transform our churches and our youth in particularly? The dictionary defines social justice as, “The equitable distribution of advantages, assets, and benefits among all members of a society.” Important to note, this is also the definition for “social-ism”: a government-controlled economy and the redistribution of wealth. Many are under the impression that social justiceis simply caring for the disadvantaged. And who among us who claims to know the Lord would ever be against reaching out to the poor and alleviating suffering? A healthy church will naturally care for “the least of these.” But “progressives” as Wallis take any collective sense of moral responsibility we may have for the disadvantaged and redefines and manipulates it to an entirely different agenda. Keep this in mind when you watch the extreme changes going on in our country today – Wallis’ social justice turns all the political hot button issues of the day into moral issues with a divine, biblical mandate. Everything from the economy, jobs and education, to health care, global warming, race issues and immigration – now carries with it the moral imperative of fairness, equity, and validity. For those who question this new global village moral imperative, their Christianity is called into question. This “new morality” is radically changing our country and has been for some time via organizations like ACORN. You may be asking, what does this have to do with the church? That’s an easy question to answer: social justice presents a social gospel, but is this social gospel THE Gospel of Jesus Christ and of the Bible? The roots of the social gospel go back to the 19th and 20th centuries. That was when many Protestant denominations took on liberal theology, which includes the post-millennial view that Jesus cannot return until mankind has brought justice to the earth by ridding itself of all social evils. At that time, slavery, temperance, women’s rights, child labor, and equity for the working who were caught in the industrial revolution’s 12-hour work days were the new causes of the liberal churches. Wallis believes he was born in the wrong century and says so in his book, The Great Awakening. He says he is longing for those early days of social justice awareness, or ‘Great Awakenings’ as they were called – and puts them on par with true Holy Spirit-led revivals; hence the name of his book, The Great Awakening – an “awakening” he is calling for today. The Berean Call, in their article “The Shameful Social Gospel,” warns of a gospel that is being tinkered with by some who call themselves evangelicals but in reality are ashamed of the true gospel, presenting one to the world that is more palatable, political, and ecumenical. Rick Warren took the social gospel to new levels, by hobnobbing with world leaders and presenting his global PEACE plan to mobilize churches to address poverty and disease at the same time he was telling Christians not to bother thinking about biblical prophecy or Christ’s return. Wallis has also found a kindred spirit in Willow Creek. 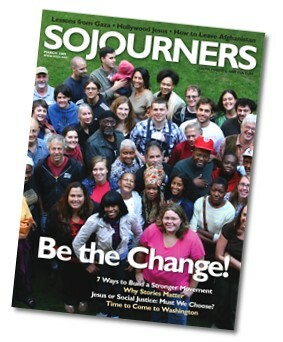 Pastor Bill Hybels’ wife Lynne is a regular contributor to Sojourners magazine, clearly resonating with the magazine’s goal. No surprise – Willow Creek offers classes on social justice, (at least one of those classes used Wallis’ book, The Great Awakening) . With over 13,000 Willow Creek Association member churches throughout the world, look at the potential influence Jim Wallis could have on the church if even half of them choose to emulate Willow Creek in their growing emphasis on the social gospel? There is a movie coming out soon titled, With God on Our Side. Radio host Jan Markell explains that “it is aimed at changing the end-time views of evangelicals and the theology that says the Jews are God’s chosen people and have a divine right to the land.” The producer of this film announces that there is “a biblical alternative for Christians who want to love and support Israel – a “new” theology that doesn’t favor one people group over another but instead promotes peace and reconciliation for both Jew and Palestinian” instead of endless Middle East violence. The only problem with that pie-in-the-sky thinking is that the Palestinian leadership does not WANT peace with Israel. They want a one-state solution; they want the destruction of Israel. The film’s message to evangelicals is that the US’ old pro-Israel foreign policy was based on end-time theology and has created great suffering among the Palestinians. But today’s more socially aware and compassionate Christians will reject that old policy and realize that the Palestinians are the victim group most in need of Christian compassion. Wallis, McLaren, and Tony Campolo are promoting the film. This film is merely another propaganda vehicle for the “progressive” social gospel indoctrination and an unbiblical spin on the clear teachings about Israel presented throughout the Scriptures. Marxism is nothing new to this old world. What Wallis is promoting is nothing new either. But let’s take the wood, hay, and stubble of Wallis’ dry old social justice gospel and throw some last days fuel on it: like the Emergent church’s mix of Catholicism and liberal Protestantism; add Rick Warren’s global PEACE plan, and Willow Creek’s annual Leadership Summits featuring speakers like Bono, Bill Clinton, Jimmy Carter, Tony Blair and Rick Warren, and before long things are burning out of control. Throw in the fact that the forward to Wallis’ book is written by Jimmy Carter, an anti-Israel leftist who is presently part of a group called The Elders (a group of 12 men and women from around the world – including Mandela and Desmond Tutu); other endorsers are Bill Hybels, Bono, and Brian McLaren (who is on the Sojourners’ board of directors and a regular contributor on its blog). A picture of a last days apostate false church comes into focus. Let’s look at some recent quotes by Jim Wallis on key biblical issues. Wallis does not talk about our blessed hope (Christ’s return). But then, this “progressive” emerging “gospel” does not offer any genuine hope nor a chance for a personal biblical relationship with God. With so much of the church ignoring and often even embracing this, the church is abdicating its responsibility regarding truth. Period. Equating biblical care of the downtrodden with the welfare state is rapidly changing the face of the evangelical church. This “pseudo-Christian” morality-based religion for the last days is infiltrating every corner of American society, and the church seems to have either lost the will to identify and counteract its influence or perhaps feels so guilty about it’s mega-excesses that it is operating out of a sense of works rather than repentance and grace. Wallis’ book is the most preachy, shaming, finger-pointing rant I have ever read; and this would make sense – in the absence of Christ’s righteousness and dwelling in a person’s life, all that’s left is self-righteousness, which of course utterly lacks the sweet savor of having a relationship with Jesus Christ where one knows he or she is saved through faith by His amazing grace and that not of his or her own works (Ephesians 2:8-9). I believe this is a preview of an even deeper, more pervasive apostasy, a marriage of religion and politics that will ultimately come together under the dictatorial reign of Antichrist, who “causeth all, both small and great, rich and poor, free and slave to receive his mark” (Revelation 13:16). Is this the playing field Wallis and others are working toward? If so, then this is deception of the highest caliber, and believers should find this extremely sobering in light of the lateness of the hour. In closing, social reformers deceptively blur the lines between two kingdoms, seeking to turn houses of worship into distribution centers for their causes. What they ignore is that all the ills of society are symptoms – the root cause is sin. They reject the cure for sin through the cross of Christ and instead treat symptoms – but in removing the Cross, they are conveniently free to affirm anyone’s beliefs, and the result is a broad-road, all-inclusive global social justice revolution. I call this the Theory of Revolution. It has been taking place right under the church’s nose for a number of years now, and it’s becoming clearer by the day who is aligning themselves with whom, and what kind of agenda is being promoted. Wallis says in his book that the majority of his audience is under thirty and half of those are under 25. He speaks frequently at major secular universities and now even at conservative Christian colleges. This is how it was done back in the 60s when Wallis was young; today’s liberal thinkers got their worldview from the counterculture agendas of America’s universities. But lest you think Wallis himself is just another counterculture hippie type out there on the fringes of the establishment – note this picture taken at the “World Economic Forum.” This is the annual invitation-only event in Davos Switzerland that brings together the world’s most influential politicians and economists as they work to bring the world under a global authority. Consider also, that Sojourners’ receives a portion of its considerable funding from the Open Society Institute, this is billionaire leftist George Soros’ organization. To those who have ears to hear, please consider these things and press forward to contend for the faith once delivered to the saints! In this late hour, now is not the time to compromise but rather to so love truth in our innermost being that nothing matters except to make sure we are on the side of truth. May the Lord direct and guide us, as believers, in all matters of faith, earnestly seeking His mind and heart in all things as laid out in His Word.